The Nissan Murano offers several comfortable interior features so that you feel as though you're riding in a luxury vehicle instead of an SUV. Enjoy the natural light of the sun or the moon with a moonroof that is easy to slide open with the push of a button. An eight-inch touchscreen in the vehicle offers access to maps and other information while you're on the road in Clovis. Apple CarPlay and Android Auto are only two of the technology features that you'll find inside the Murano. Use the front and rear parking sensors when you're trying to get your vehicle just right in a parking spot. Automatic temperature controls keep the interior of the vehicle comfortable whether it's in the winter or summer. Cruise control and traffic sign recognition keep you safe while you're driving along with keeping you at a safe speed. 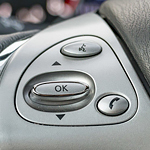 The push button ignition takes away the need for a traditional key along withe the remote start option that Lithia Nissan of Clovis can show you for added convenience.